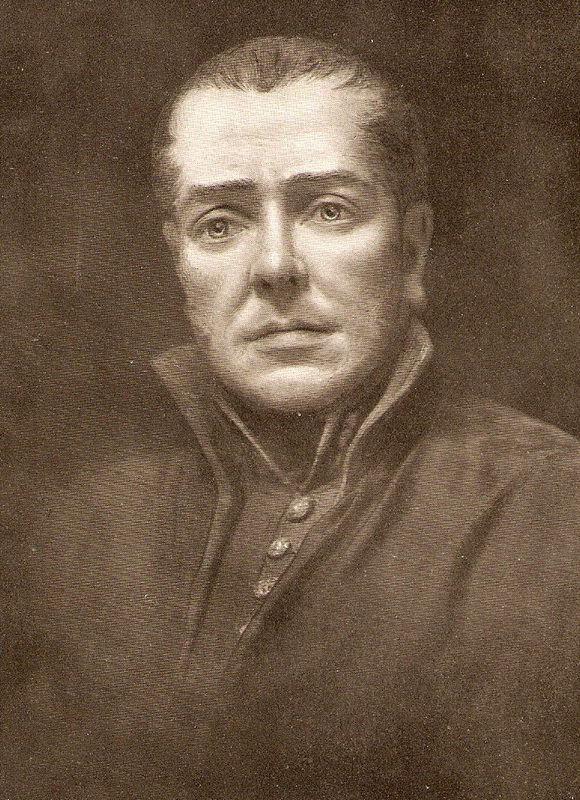 John Theodore Tussaud, the great grandson of Madame Tussaud, founder of the famous wax works exhibition in Marylebone, London, lived for many years in the village. According to a letterhead used for correspondence, his family lived at The Studio New Road, now known as ‘Hawthorns’, 17 New Road. John Theodore’s great grandmother was born Marie Grosholtz in Strasbourg, France, and at a young age became proficient as a wax sculptress. In the late 1700's she worked for Dr. Philippe Curtius, skilfully producing wax portraits, including those of the royal family at Versailles. On Curtius' death in1794 she inherited his collection of wax models. 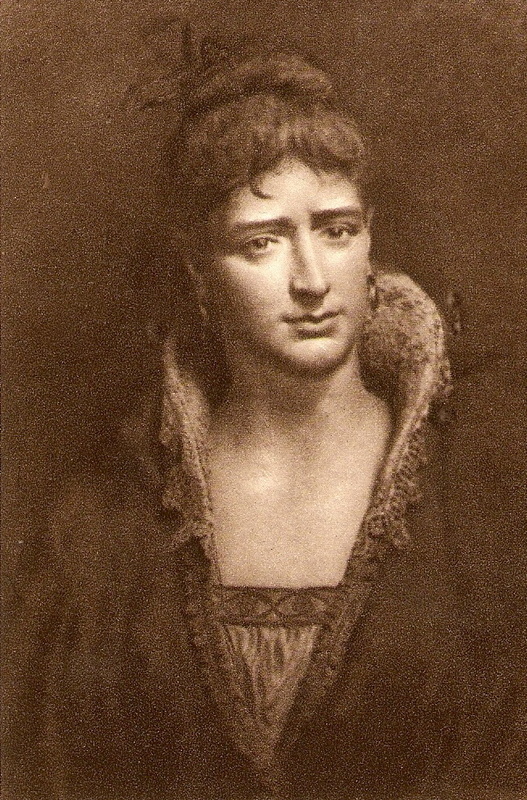 The following year she married François Tussaud. The outbreak of the French Revolution brought her into danger as a former royalist, but she was saved from the guillotine and actually made the death masks of many of the aristocrats she had known. François and Marie had two sons, Joseph and Francis. She used her collection of wax models to produce an exhibition which soon became very popular as she toured Europe. During Napoleon's rule circumstances made it unwise for her to live in France and she came to England in 1802 without her husband and continued touring the British Isles with the exhibition for approximately 33years. She eventually settled in Baker Street, London. On her death her two sons inherited her collection. The exhibitions continued to be as popular as ever and the collections are now exhibited worldwide. The family business was sold in the late 1890's due to financial problems, but members of the family maintained connections with the new owners, who continued advertising the business as Madame Tussaud's. The house in New Road was built in c1863 when the land belonging to Hollowtree Farm, on The Green, was sold for housing and a road was created. 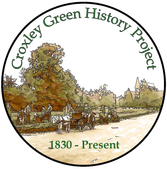 Until then the village had no recognised street or road and consequently it was named Croxley Green New Road. Plots were available for individual builders. The house was originally built as two villas but was converted to one property for the first occupant comprising ten bedrooms and two staircases. The 1911 census records the Tussaud family occupying the house and the entry reveals John Theodore and his wife had been married for 21yrs and had had ten children. John Theodore is 51yrs old and his occupation is given as artist modeller and sculptor as well as Managing Director of Madame Tussaud's. His wife Ella is 44yrs old and of the ten children six were recorded as being at home on the day the census was taken. Jack, 21, and Frank, 18, are both working with their father. Dora,19, appears not to be employed. Hugh, 16, is still at school. All were born in St John's Wood London. Angelo, 9, was born in Croxley Green and is at school, whilst Joan, 4, also born in the village, is still at home. 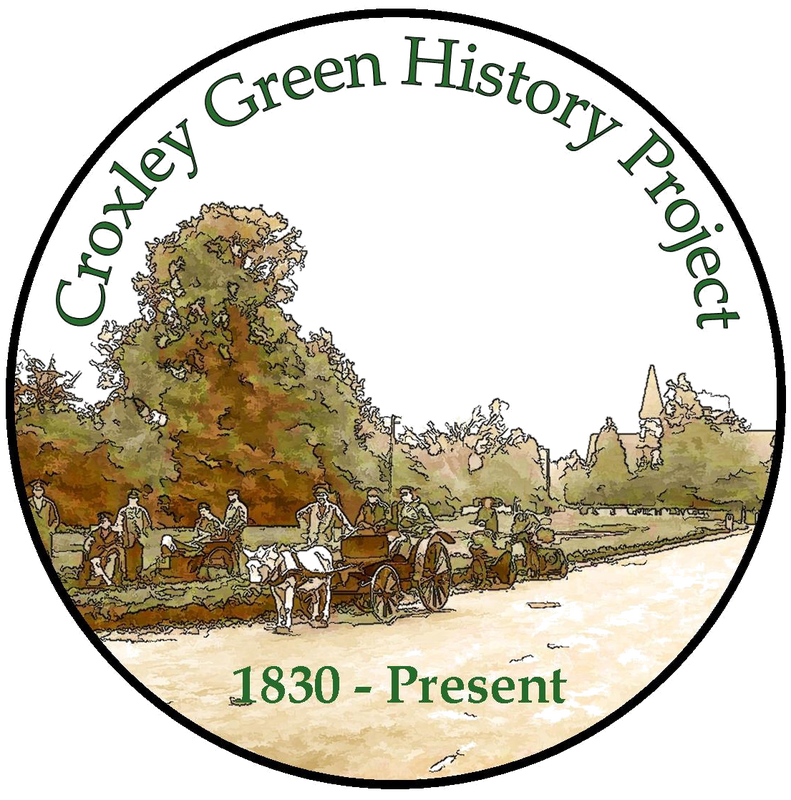 From these records, and given the children’s ages, it seems likely that the family moved to Croxley Green soon after the 1901 census as they are not recorded in it. John Theodore was as dedicated as his great grandmother to producing lifelike models of people who ranged from all walks of life. 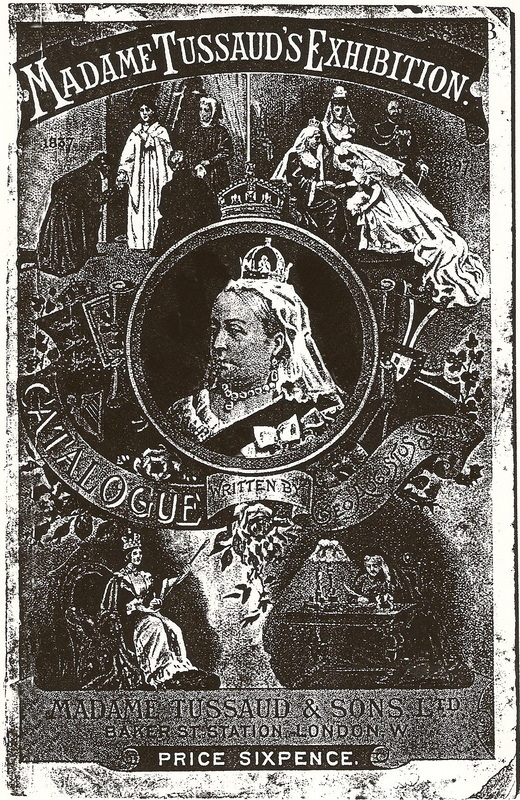 Images that were used were found many years later and appear to be engravings from John's own collection. These include Napoleon and members of the Bertrand family staff who also lived on St Helena with Napoleon. 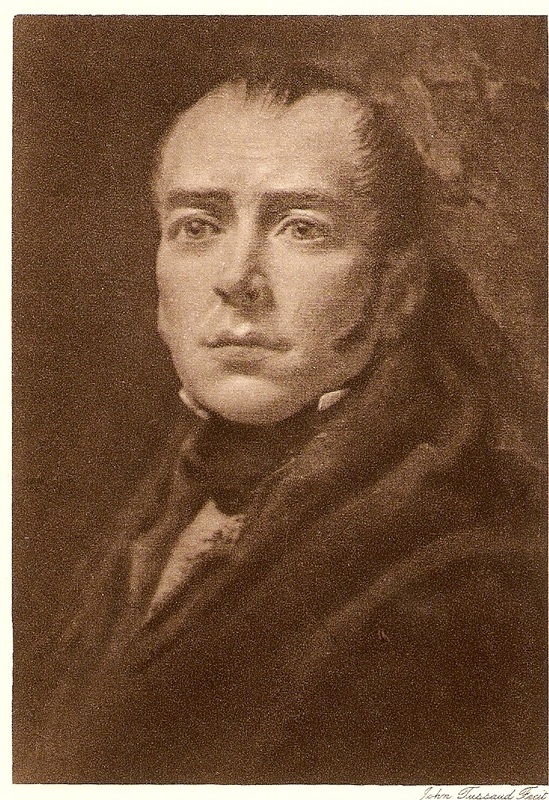 John Theodore had a vast collection of models and memorabilia associated with the life of Napoleon. 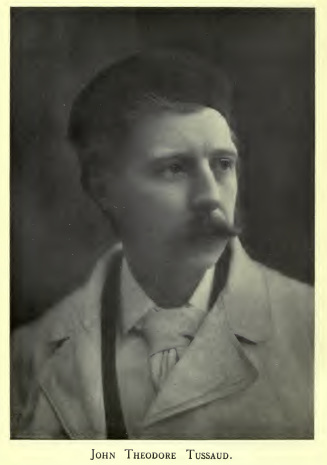 He was fascinated by this period and wrote many biographies about leading generals associated with Napoleon and the London exhibition made a special feature of this in 1913. Unfortunately a fire in 1925 destroyed much of this material as well as other models. At the rear of the property in Croxley Green a studio provided a workroom where accomplished young ladies would be involved with the wax models for the exhibitions. 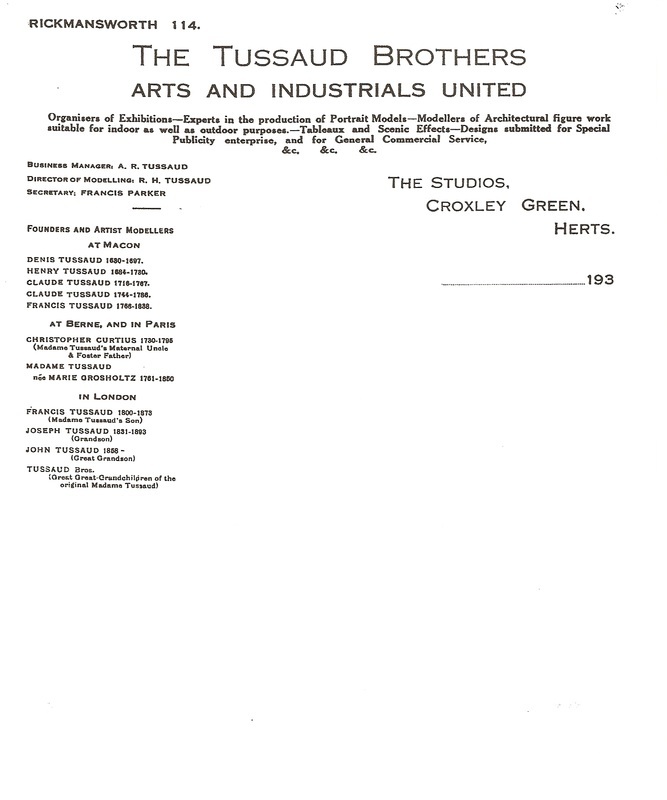 Albert Freeman, the Rickmansworth Urban District Council (now TRDC) surveyor, recorded in his diary for 20th May 1915 a visit to the studio to check the dimensions in accordance with regulations so that working conditions were adhered too. It is possible that as the First World War in Europe was progressing and London becoming threatened from bombing, it was decided to move this section of the business to John Theodore's premises and build a studio in the garden. If this was the case the young ladies could also have been sent to Croxley Green from London or perhaps local young ladies were given the opportunity to receive training and acquire skills. It would be interesting to discover which was correct. An article in the Watford Observer (late 1980's) suggests there was an opportunity to view the wax models as there appeared to be an admission window for payment when they were created and during the Tussaud occupancy. 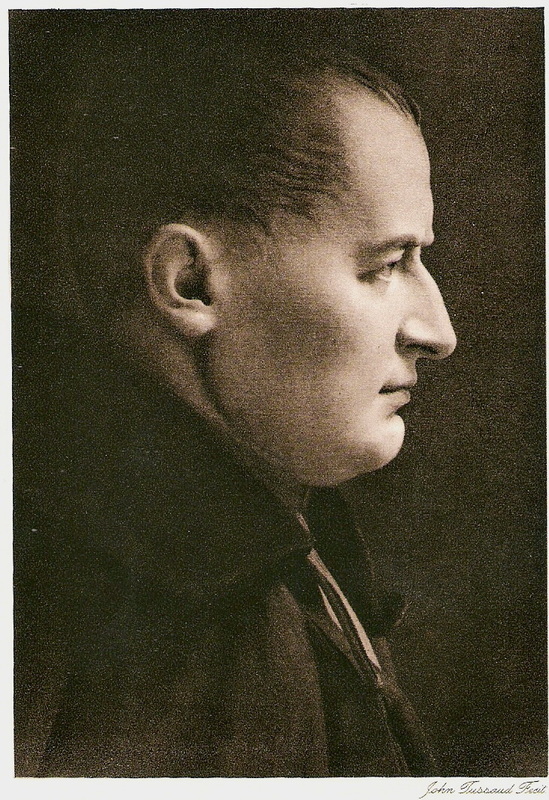 John Theodore is recorded living at the house until his death on the 13th October 1943 . 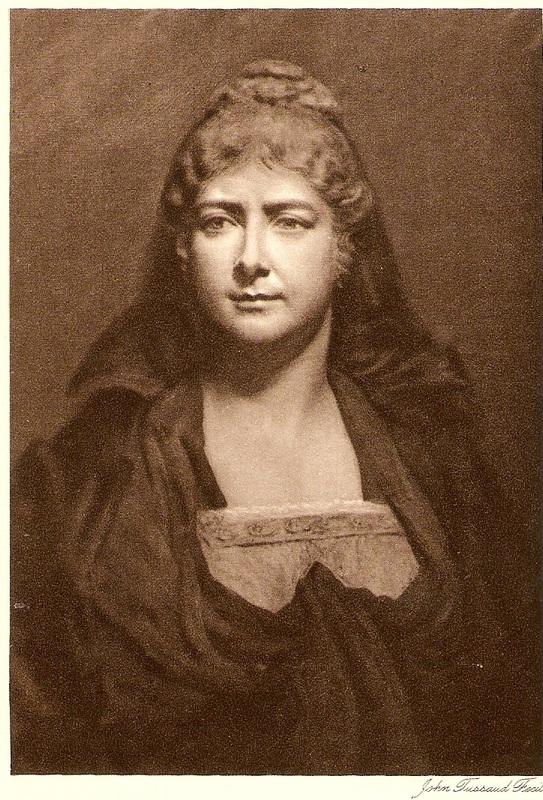 Further evidence of the family business was found by subsequent owners in the cellars of the house, in particular, copies of prints that John Theodore Tussaud had made from original portrait studies which confirmed his interest in the Napoleon era. A black tin box was discovered containing papers from Paris relating to the death of François Tussaud, though the actual contents are unknown. When the house and the studio in the garden was sold, the Studio was used for a short while as a nursery school. It was also used as an entertainment room where plays were performed when the Samuel family resided there. The Samuel brothers as young men worked at the Pinewood Studios and created the large scenery for the film makers. They also produced the prehistoric animals for the 1935 & 1937 village royal celebrations as well as members of Neggy Wilson's Mummers troupe. 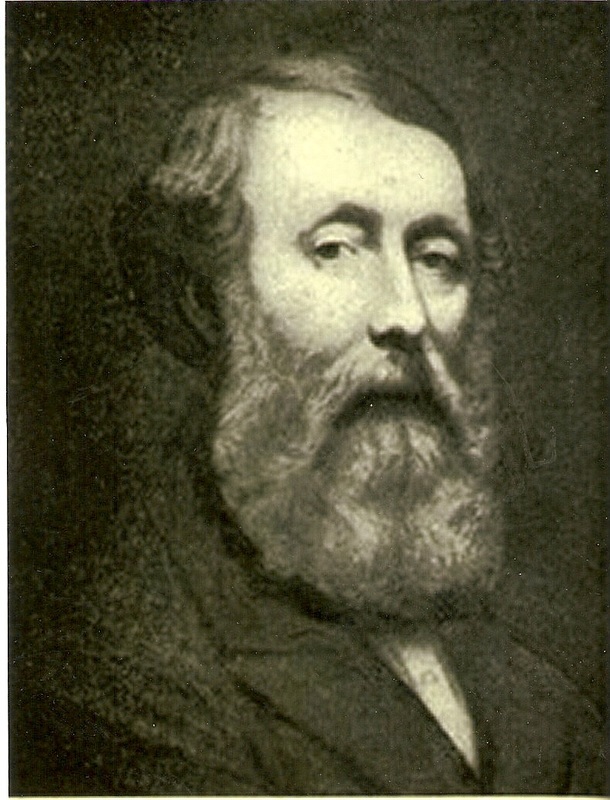 The following five images were found many years later and appear to be engravings from John's own collection. 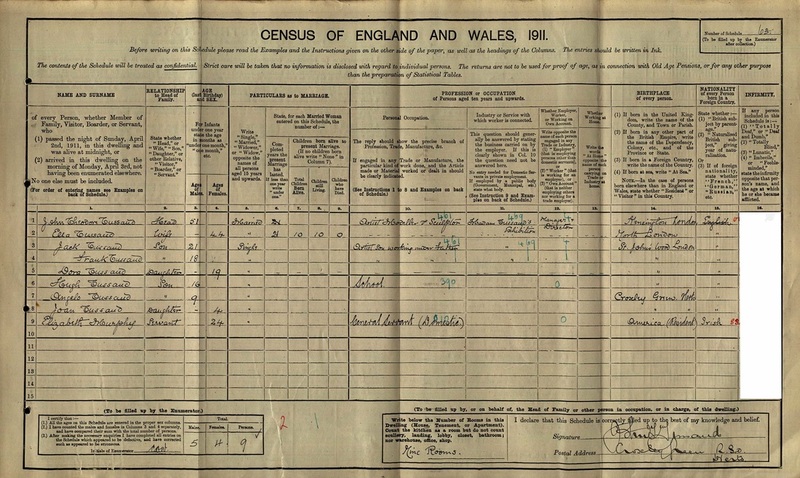 John and Ella were married for 21 years and had 10 children all were still living at the time of the census. Six are mentioned in the census. As the enumerator only records the persons living in any accommodation when he calls, it is possible the remaining children were either at a boarding school and / or living elsewhere for that period. The 1911 census is the first time the main occupant at home, records the details of each person. This is of course if they can do so. These documents not only give more information than previous census completed by the Enumerator but shows the handwriting too.